Rising Sophomore Rafael Davidian came up short in the 1st round of the Future event in Saskatoon, Canada, losing to Arthur Karagezian (USA) 6-3, 6-0 on Tuesday. “Arthur played a solid match, but I definitely should have played better though,” Davidian said. With the loss, Davidian’s record on the Futures Tour drops to 22-12 (0-7 in main draw) in singles play. In the past year he has played 12 Futures, having qualified seven times of the main draw. 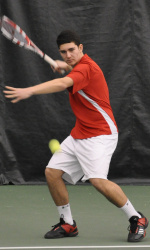 Unfortunately, he has been unable, so far, to become the third active Ute player to earn at least one ATP point. ‘Rafa’ will now enjoy some time with his family, after which he will hit the road again for a few more Future events before returning to the U in time for the first day of classes for the fall semester.